Microsoft could be testing a new Windows 10 option which would allow Windows 10 Home users to pause updates for 35 days. Currently, Windows 10 Home users cannot really pause updates at all -- beyond picking a time or "snoozing" them. 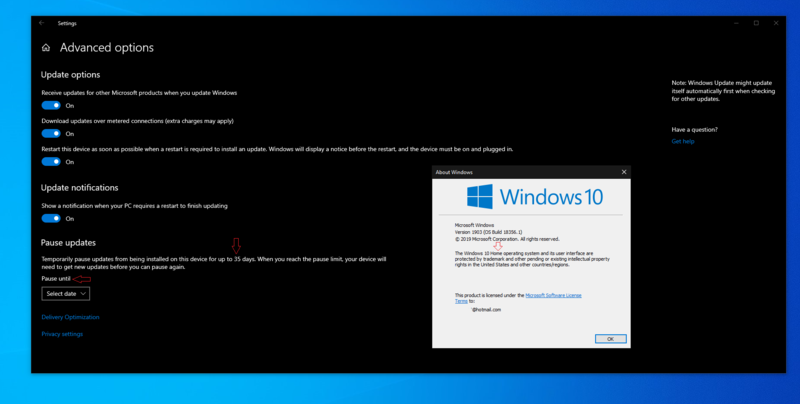 Earlier this year, Windows 10 Home users running test builds of the 19H1 (Windows 10 April 2019 update) noticed that Home seemingly got a seven-day pause option. However, that seven-day pause option seems to be an Insider-only thing, notmeant to actually show up as a user-selectable option on non-test builds. This week, user "Leopeva64-2" posted on Reddit about seeing the Windows 10 Home 35-day pause option on the latest Windows 10 19H1 build. He clean-installed build, 18356.1 on a device that wasn't installed in the Insider program automatically. (Microsoft officials noted that some devices accidentally opted out of the Windows Insider program after installing 18356.) Testers who don't actually do a clean install when downloading this particular build seemingly won't see the 35-day pause option. The option Leopeva64-2 shows in his post on Reddit says "Temporarily pause updates from being installed on this device for up to 35 days. When you reach the pause limit, your device will need to get new updates before you can pause again." "The Windows Insider Program was created to enable Microsoft to test different features and functionality, which will influence future versions of Windows. Microsoft regularly test new features and changes to existing features to see what resonates well with fans." That Microsoft statement neither confirms nor denies that this is a feature that will end up in 19H1 when it starts rolling out to mainstream users this April or so. It's worth noting that this could simply be a case of a test build inaccurately displaying an option available on Windows 10 Pro on a Home version of the OS. But if the 35-day pause for Home users does make it into Windows 10, some users definitely will be interested in using it the same way that Windows 10 Pro users can today: To give them a bit of a buffer while Microsoft irons out problems with new Windows 10 feature releases in the early days of their roll-out.